I mean seriously, when Muggles get mad, they get mad! Now, this video got almost 4.5 million views since its release back in January 2006 by christmassacre, so we’re all not really surprised how it went viral. Over 5,000 people liked this video, but almost 500 dislikes grew. Why are there any dislikes? Maybe, besides those overprotective parents. And again, the video isn’t even that long, it’s only almost a minute long. And to tie in, I’ll show you the other video of Hermione sucker punching Draco. 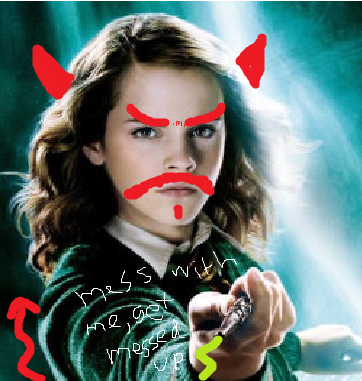 So this is an important life lesson: never mess with a Muggle, let alone Hermione. 😦 I even got this pic sent by her!